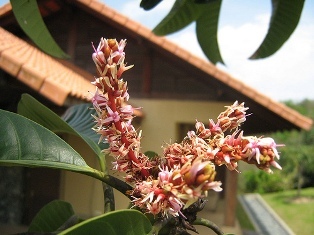 Bachang is.found wild as well as cultivated in Indonesia, Malaysia, Myanmar and Thailand. It is believed to a native of Indonesia, Though it is quite popular in these countries, it is not known much as a fruit elsewhere. An evergreen tree 30-35 m tall, straight bole without buttresses, bark light brown to dark greyish-brown, shallowly fissured with broad flat ridges, containing irritant whitish sap turning black on exposure; crown dense, foliage dark green, branches massive. Leaves elliptic-oblong to broadly elliptic, sometimes oblanceolate, 15-40 cm x 9-15 cm, stiffly coriaceous, dark green above, clear green below, apex sub-acute, sometimes rounded or slightly emarginate, base cuneate or attenuate, more or less bullate between the nerves; petiole 1.5-8 cm, stout, very swollen at the base. Panicles subterminal, upright, pyramidal, 10-40 cm long, sparsely branched, rather densely flowered, deep reddish-pink, inflorescence axes stout, deeply red to copper red; flowers 5-merous, scentless; sepals obovate- lanceolate, 4-5 mm long; petals narrowly lanceolate, 6-9 mm x 1.5-2.5 mm, pale reddish-pink at the base, pale yellow towards the apex, reflexed; stamens 5, 1(-2) fertile, filament ca. 8 mm long, pinkish-purple, anthers dark violet, other ones smaller, filaments connate at the base; ovary subglobose, yellow, style excentric, white, 6-7 mm long. Fruit variable in size and shape, an obliquely ovoid-oblong or almost globose drupe, 9-14(-16) cm x 7-12 cm, dirty dark olive-green or yellowish-green, smooth, dull, with brown lenticels, nose reduced to a point or slightly prominent, rarely prominent, skin ca. 5 mm thick; flesh pale orange yellow or yellow, fibrous, juicy, with strong smell and taste of turpentine at its full extent. Stone plump, ca. 6 cm x 5 cm x 3 cm, coarsely fibrous; seed monoembryonic. 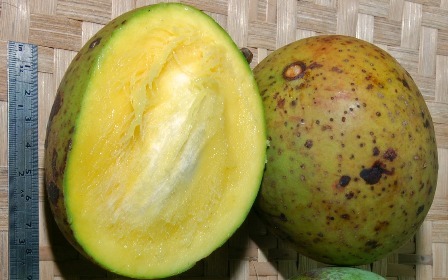 Bachang fruits have to be peeled fairly thick for eating fresh. The fruits contain irritant juice near the skin. This juice can irritate the lips and that is why the peel has to be removed. The content of the irritant juice is restricted to the proximity of skin only and the pulp below that is perfectly edible. The fruit tastes good in spite of its turpentine like smell. The taste is sometimes likened to that of a durian. Unripe are also used as salad and also used for making pickle and chutneys. 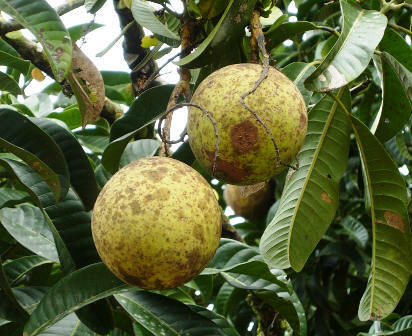 The fruits have 65% edible portion which contains: water 72.5%, protein 1.4 %, carbohydrates 25.4 %, calcium 21 mg, phosphorus 15 mg, thiamine 0.03 mg, B-carotene equivalent 0.218 mg and vitamin C 56 mg per 10 g.
Bachang trees are raised from seed. The seedlings do better if kept in partial shade. The seedlings require to be irrigated generously for faster growth. 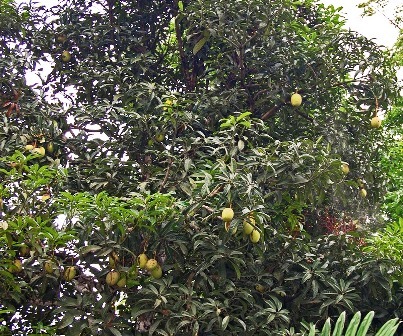 Bachang has turned out o be good rootstock for mango, especially for planting under humid climate conditions. 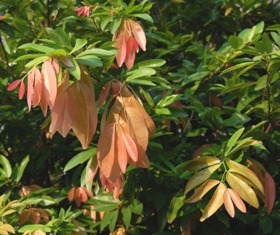 The propagation technique used is Modified Forkert Budding. A spacing of 14-16 metres is recommended for orchard planting. Two major insect pests viz. trunk borer and the mango fruit weevil (Cryptorrhynchus magiferae} are of common occurrence in this fruit. Bachang is used only in South-East Asia and that too for traditional uses. This role is not likely to change much in the near future. So it does not have good commercial prospects elsewhere and its cultivation may not become popular outside the South East Asia.